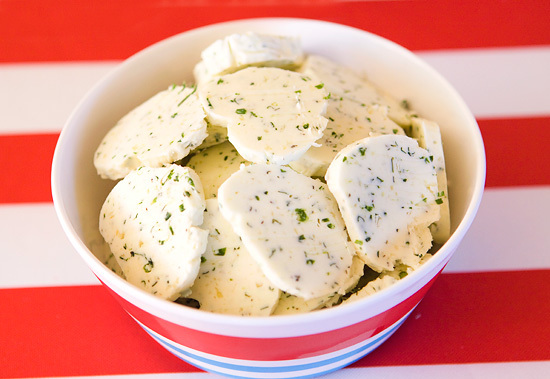 I made a batch of this garlic herb butter to put on some corn on the cob at my daughters birthday party, and I am obsessed. I have found so many ways to use it the last few weeks. On corn on the cob, pasta, mashed potatoes, fresh bread, you name it! It really is that good! And, I have been able to use all the fresh herbs from my garden that have been springing up all over the place. In a medium bowl (I used my kitchen aid mixer with the paddle attachment), beat the butter on medium until nice and whipped. Roughly chop up garlic and sprinkle some of the salt on it. Using your knife smash and chop the garlic until it makes a paste. Place mixture carefully onto plastic wrap and roll it up. Place in the freezer until set, then you can move it to the fridge. Slice and serve. Store in fridge. Serve it with fresh bread, rolls, corn on the cob, pasta, make garlic bread, mashed potatoes, with seafood. *If you are serving with fresh rolls or bread, you can leave it whipped and serve it right away. Yum! This looks delish. BTW, unrelated, but wanted to say thanks for your Rast and bad tutorials…we repainted our compressed wood changing table using your tutorial with great results. Also ended up ordering the ring pulls from Lee & Veritas and am very happy with the end product! Thanks!! In Tahiti the food trucks at the pier serve this butter with Steak Frites. A nice bed of hot frites (fries) a bit of butter than a huge steak on top with another pad of butter…sooo yummy! Not healthy…but so yummy!